Snowmobile riders from across the country travel to Fourteener Country to experience some of the best and most consistent snow in the Rocky Mountains. With hundreds of miles of groomed trails and even more ungroomed terrain riders of every age and ability will discover a lifetime worth of scenic riding. Three established snowmobile clubs groom and maintain many of the most popular routes and access trails in and around the towns of Buena Vista, Salida, and Leadville. 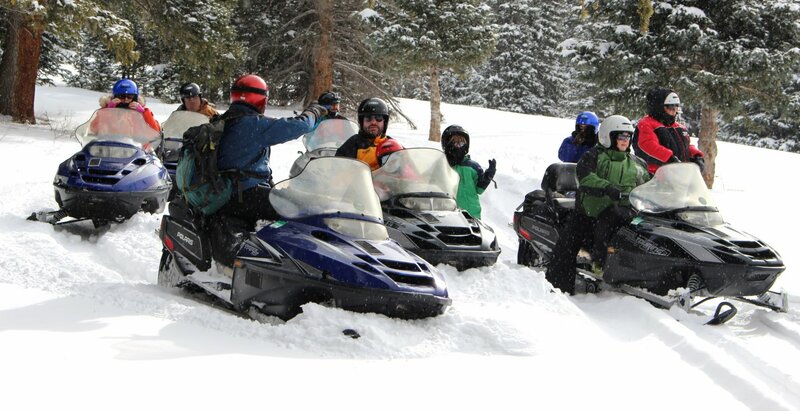 Buena Vista’s Snow Drifters Snowmobile Club grooms approximately 130 miles of trails on and around Cottonwood pass. The Salida Heart of the Rockies Snowmobile Club grooms Marshall Pass Road and the High Riders Snowmobile Club of Leadville grooms the Turquoise Lake Road. Old Monarch Pass Road is another area favorite that offers yet another opportunity to ride along and across the Continental Divide. The snowpack and winter weather can be unpredictable and change quickly; prepare for the unexpected. Know before you go! Click Central Colorado Avalanche Information line or call at 719.395.4994 to check current conditions.